Purchase 25 of our C9 incandescent Bulbs or C9 LED bulbs to fill them. If you are purchasing traditional glass bulbs, we do suggest you pick up an extra box of 25. Do not run these 25-foot cords in series with any cord that has a different gauge. All of our 50, 100 and 100-foot cords are 18 AWG so they cannot be run in series with our 25-foot cords. 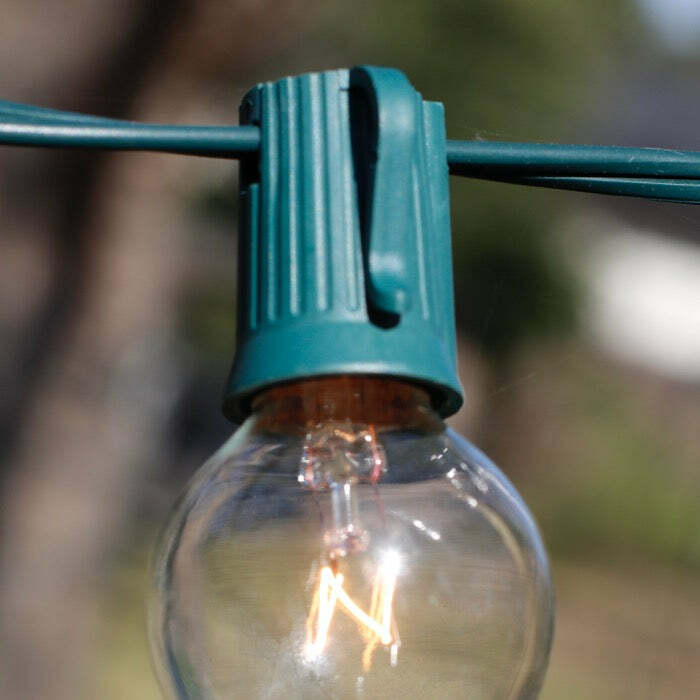 the wire is perfect for the twinkle bulbs!! right now they are "twinkling".. I did hours of research about LED lights for my tree, the conclusion i came to was that they just don't make a good set that has accurate colors and is of good quality. I was looking for the vintage look of the incandescent C9's. I finally gave up after several hours of searching and decided to go vintage all the way and get this set. I'm glad i did, this product is high quality and i have not had any problems, looks great on our Christmas tree! Don't forget to buy bulbs! Item shipped the next day. Arrived quickly. Exactly as advertised. 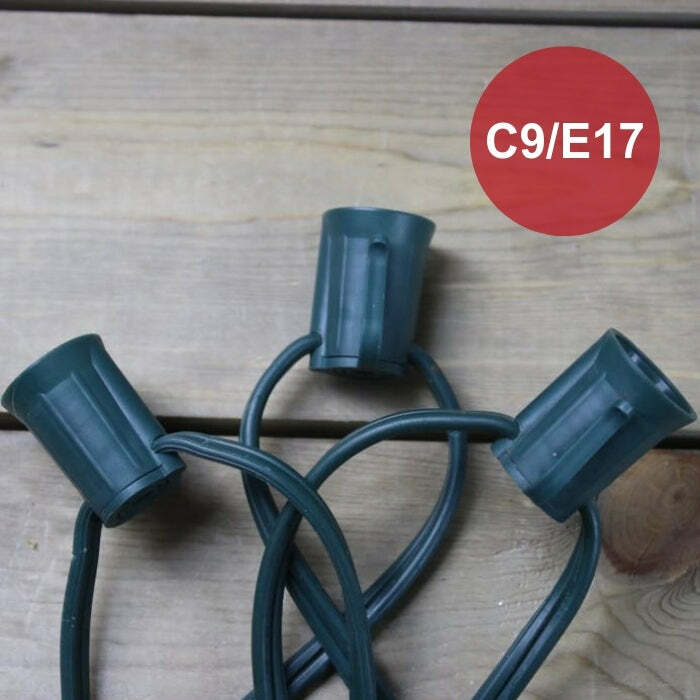 I bought 20 of these to use with Stakes (the 4.5" universal ones are the simplest and best) and LED C9 bulbs. The are a very good product, and I like the 25' length because with the stakes, they are easy to keep organized, and also with plugs on each end, you can easily run 6 strings of LED's together which is much simpler than having to run a power cord to each string. Q: Does this 25L C9 empty stringer set have weep holes or is the bottom of the socket solid? A: The sockets on this cord do have weep holes. Q: I only need a strand of 20 lights, what do I do with the 5 extra sockets? Do you have a screw in plug or do I just try and wrap the 5 unused sockets with plastic bags and electrical tape? A: You can wrap your sockets with electrical tape to keep out spiders and dust. Since these cords are wired in paralled you can clip the light cord after the last socket you are using and wrap the end of the cord with electrical tape or dip the end in "liquid electrical tape" that can be purchased at the hardware store. Make sure it is out of reach. If you have any additional electrical questions about your installation, please contact a master electrician. 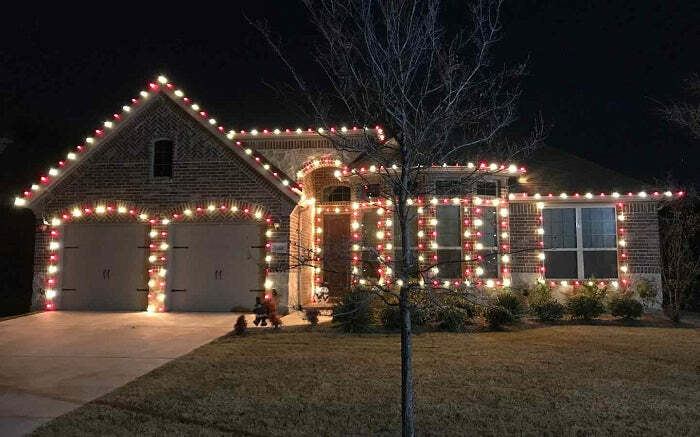 Q: Is the 2 still the maximum number of strings when using LEDs? A: Yes, per our given specifications two cords in series is still the max. If your project needs more than 50 feet of cord, consider using a 100-foot cord instead and clipping it to fit. Be sure to terminate the clipped end. Note, our 50 and 100-foot cords come with a single male plug. We suggest that during installation, they be run out from a centrally located splitter/extension cord like a "T". Q: What is the maximum amount of sets you can connect? A: These 25-foot 20 AWG cords can be run a MAX of 2 sets in series. 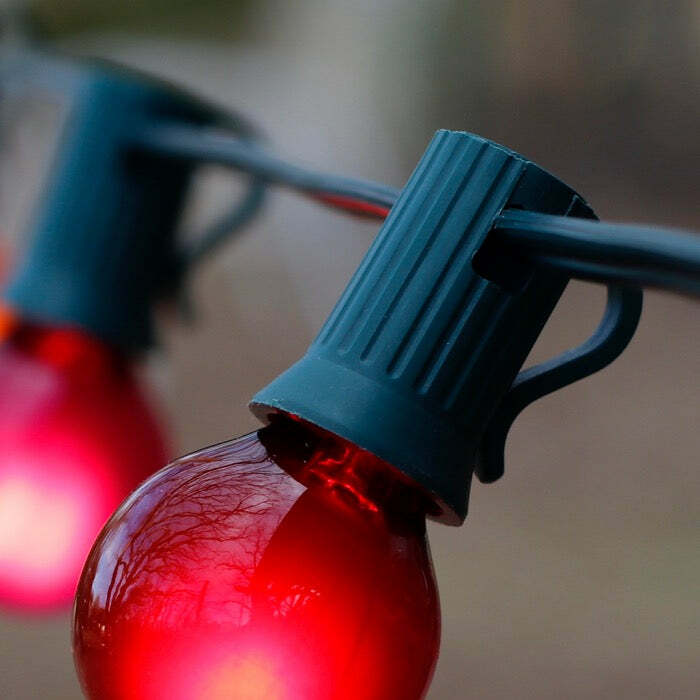 If you find that you need a longer run of lights, then you might consider the 50 or 100-foot cords. Q: does this cord have male and female ends? and if so how many strings can be connected at once? A: This 20 AWG stringer cord does have a male and female connector. You can connect up to 2 sets in series maximum. Do not combine 25 and 500 foot cords because they are made with different gauge (AWG) wire and have different specifications. Q: How many bulbs can you fit in each socket? A: Thanks for your question, Cindy. While there are some lamp bases that do accommodate more than one bulb all of our sockets accept just a single bulb. You can choose from either traditional bulbs or led bulbs. Also note on this cord that there are 25 sockets spaced 12 inches apart so each cord takes 25 bulbs.